Harvard Business Review (HBR) claims Data Scientist and Business Analyst to be the hottest jobs in today’s market. Big Data has set a veritable explosion in the global market, including a larger market of the US. The big data revolution has arrived to take care of the huge volumes of data available on multiple networks and channels. 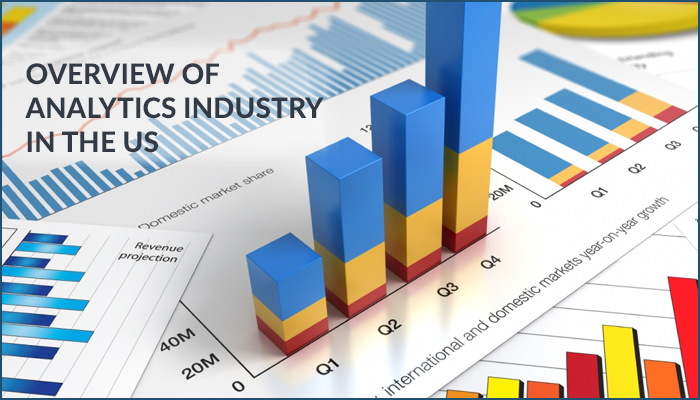 While we deal with several data operations in multiple industries, the Analytics market in the US comprises Big Data Analytics, Visual Analytics, Social Analytics, Healthcare Analytics, Statistical analytics, Customer Analytics, Business Analytics and others. The big data and analytics market in the US is constantly increasing in dollars extending up to several million and a billion dollars. Briefing about the main theme of the article, i.e. Analytics- it is the science of analyzing and examining data and presenting into relevant and meaningful information. Many of our jobs in organizations and self-started businesses involve managing and organizing data. Similarly, the world has gone online and most of the stores and business groups are promoting their products to clients and consumers through online channels. Thus, the majority of MNCs in the US is focusing on Data Analytics to grab success and compete with one another. According to the recent reports of this year, the global text analytics market has the potential of reaching $6.5 billion by 2020. Google Analytics is the most important marketing tool used by a large number of business groups in the US and the other part of the world. In fact, it is the most convenient and beneficial tool to let e-Tailers identify and Improve the traffic to their particular online websites. According to an IDC report, 2011, the industry had grown by almost 14% in 2012, and is anticipated to grow to $50.7 billion by 2016. Gartner Report, 2012 further forecasted that the market for analytics and business intelligence (BI) platforms in the US will be the fastest growing segment in the software industry. The emerging trends like data-as-a-service coming, analytics will continue to see further growth prospects. Predictive Analytics as a part of text analytics is an alluring application used by the entrepreneurs and established enterprises in the United Sates. It provides intuitiveness on the unstructured data, text and enables organizations to devise business strategies accordingly. Text Analytics is widely accepted in various regions of North America because of the early adoption of big data in the region. Lately, Healthcare Analytics is the upcoming big data market that consumers and medical groups are focusing upon. It includes Prescriptive analytics, which propose recommendations for the treatment based on the previous details of the patients. This data analytics platform makes use of population trends, economic growth, and health trends, equipment availability and other factors anticipate when, what and how things will happen. It further utilizes structured and unstructured data like videos, texts, images and audios. Adoption of latest technology will continue to grow in most parts of America to analyze streams of events and data. One of the major critical focuses on Americans and cross-regional Multinational companies for big data analytics is Internet of Things (IoT) event to be held next year (2016). Most companies from Fortune 500 including Microsoft, IBM, Amazon and others have joined hands with the event, particularly for “Analytics of Things”- a multivariate form of dealing with big data, its detection and bringing data to the analytics.